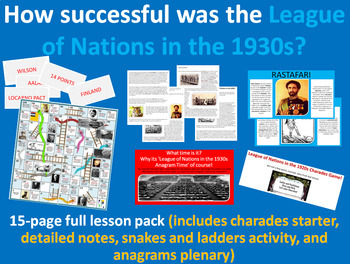 In this lesson students explore the Key Question 'How successful was the League of Nations in the 1930s?' They begin by acting out cards which they will have covered in the 1920s as a game of charades. The class then work through a set of detailed notes before playing a game of snakes and ladders bingo. It needs to be printed in colour and laminated but these work great with students and as an activity the league's successes (ladders) and faults (snakes) become very clear. The lesson concludes with an angram plenary to test student comprehension of key terms. I hope your students enjoy this lesson as much as mine do.